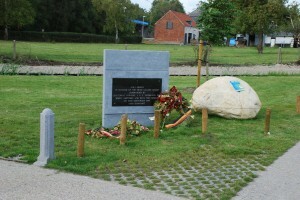 The plaque commemorating the capture on 10 September 1944 of ‘Joe’s Bridge’ by the Irish Guards has been relocated. For years the plaque dedicating the bridge to the group’s commander, Lieutenant-Colonel J.O.E. Vandeleur DSO, was posted below the bridge’s northeastern ramp. 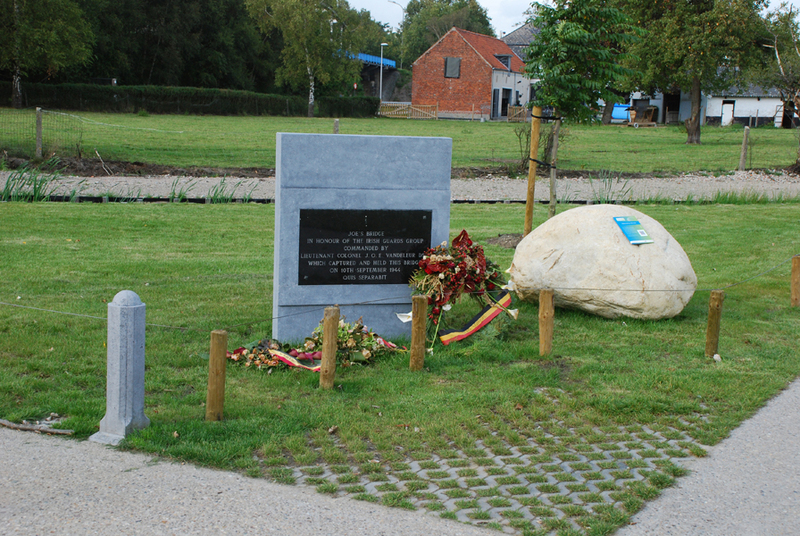 This summer the plaque was fitted upon a new stone and relocated to a park on the other side of the Maas – Schelde Canal (Bocholt – Herentals Kanaal) southeast of the bridge. The slip road to the park can only be entered by driving north on the N715 from Overpelt, Belgium towards Valkswaard, Netherlands.